Circle 8: The Lie: Once you leave the icy water and swim to the shore writers often lie to themselves. My novel is brilliant! My mother loves it! This is easy! What are those other writers complaining about? I write just like [ insert name of bestselling novelist here]! There are many flatterers at this level. They are your friends, your parents, your significant other. They lie because they want you to feel good about yourself. They lie because they know nothing about the craft and business of writing. They lie because they love you. And you believe them. And you only wrote one chapter so far! You’re a creative genius! ( ahem ) There are many seducers at this level as well. They promise cheap editing, mega sales, and fame. They claim to know the secret to success. They say you need X amount of Twitter followers or you MUST have a blog or a platform or a presence. They say this is the best course or only conference you need. There are lots of hypocrites, advisors, and ‘experts’ out there. Be wary. Circle 7: The Pain: Once you uncover The Lie you must push forward with your novel violently. You will finish! You will! You read blogs and how-to books, attend conferences, sign up for creative writing classes, participate in critique sessions, and join writing groups. Your eyes bleed from looking at the computer screen. Your fingertips become calloused. Your tongue is scalded by too-hot coffee. Your back aches from remaining hunched over the keyboard. Your soul liquifies as it pours into your manuscript. You neglect your friends, order take-out, and forget to do the laundry. But you swear to yourself that you WILL finish! Circle 6: The Burn: It might feel like you’re stuck in a flaming tomb…breathing in the foul stench of your first draft, deleting those very words you worked so hard to write only a month prior. Perhaps, only the charred embers of the original manuscript remain. Or maybe, your dream of finishing this “damn novel” is fried. Or even worse, the burn may come from a fellow writer, a beta reader, or a friend telling you the faults and problems of your masterpiece. Circle 5: The Rage: If you are not burnt to a crispy crunch you dowse the flames with rage. Like the iconic line, “Rage, rage against the dying of the light” ( Dylan Thomas ) you rage, rage against your novel’s weaknesses. You learn more. You write more. You don’t just aspire to be better you work at becoming better. To learn from your mistakes. You will not go gently into that novel good night! You fight your way through….even if it’s gonna kill you. Circle 4: The Want: You have the best damn novel you could possibly write and now…now you want more. You want it OUT THERE. You want people to read it. You want people to love it! You want to be published. You and about a zillion ( no exaggeration here) others want the same thing. Your drive to make this happen propels you up the novel mountain. The weight of your want pushes you forward. You hoard every bit of information about the publishing biz. You prepare for the next level of Writing Hell. Circle 3: The Hunger: You need an agent. You must find an agent. You have heard and read many stories about these allusive mythical creatures. Many reign in New York City. They live in castles surrounded by a moat full of unsolicited manuscripts and the drawbridge is never down. They are the gatekeepers between you and Your Dream. Some writers study the art of querying. They read blogs and how-to books, attend seminars, pitch in person, and pay to have an editor or agent critique the first 5 pages during a conference. Some do no query-agent homework at all. Some stalk agents ( bad idea ). And so you write a query…again and again and again—because the first five sucked—and then you research agents interested in your genre. And you stare at that SEND command on your email. You stare at it long and hard. Because this is a game changer. 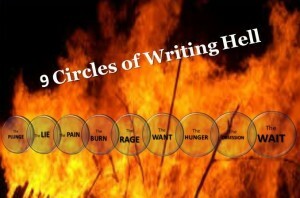 In what circle of writing hell are you? I’m somewhere between the 5th and 6th circles, between the Burn and the Rage. Oh my god, there’s still so much to learn, so much to revise, so much to improve! Will it ever end? ARGHHHHHHH! Glad you had a laugh. We love every moment of the pain, don’t we?! Stay positive while climbing out of the circles during your writing journey! Glad you enjoyed! Sometimes we just need to step back and see the funny in the writing process to get some perspective.